In this article, we will explore all Object Class methods with examples. The Object class, in the java.lang package sits at the top of the class hierarchy tree. Every class is a descendant, direct or indirect, of the Object class. Every class you use or write inherits the instance methods of Object. You need not use any of these methods, but, if you choose to do so, you may need to override them with code that is specific to your class. In this article we will discuss below methods inherited from Object class. The below diagram is a Object class diagram shows a list of methods it provides. clone() method throws a CloneNotSupportedException if the object's class does not support the Cloneable interface. Subclasses that override the clone method can also throw this exception to indicate that an instance cannot be cloned. Let's discuss one more example using the Closable interface and clone() method together. First, create a Person class which implements a Closable interface. Note that we have to override the clone() method from Object class and made a call to Object clone() method using super.clone(). The java.lang.Object.equals(Object obj) indicates whether some other object is "equal to" this one. Note: If you override equals(), you must override hashCode() as well. The java.lang.Object.finalize() is called by the garbage collector on an object when garbage collection determines that there are no more references to the object. A subclass overrides the finalize method to dispose of system resources or to perform other cleanups. The finalize() method may be called automatically by the system, but when it is called, or even if it is called, is uncertain. Therefore, you should not rely on this method to do your cleanup for you. For example, if you don't close file descriptors in your code after performing I/O and you expect finalize() to close them for you, you may run out of file descriptors. Let's override finalize() method from Object class into Person class and test it using main() method. The java.lang.Object.getClass() method returns the runtime class of an object. That Class object is the object that is locked by static synchronized methods of the represented class. The following example shows the usage of lang.Object.getClass() method. The java.lang.Object.hashCode() method returns a hash code value for the object. This method is supported for the benefit of hash tables such as those provided by java.util.HashMap. 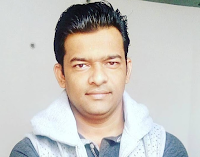 It is not required that if two objects are unequal according to the java.lang.Object.equals(java.lang.Object) method, then calling the hashCode method on each of the two objects must produce distinct integer results. However, the programmer should be aware that producing distinct integer results for unequal objects may improve the performance of hash tables. By definition, if two objects are equal, their hashcode must also be equal. If you override the equals() method, you change the way two objects are equated and Object's implementation of hashCode() is no longer valid. Therefore, if you override the equals() method, you must also override the hashCode() method as well. void notify() - This method wakes up a single thread that is waiting on this object's monitor. void notifyAll() - This method wakes up all threads that are waiting on this object's monitor. void wait() - This method causes the current thread to wait until another thread invokes the notify() method or the notifyAll() method for this object. 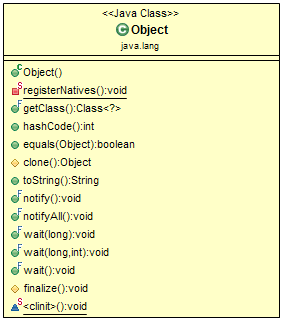 The java.lang.Object.toString() method returns a string representation of the object. In general, the toString method returns a string that "textually represents" this object. The result should be a concise but informative representation that is easy for a person to read. It is recommended that all subclasses override this method. The following example shows the usage of lang.Object.toString() method. Nicely explained each Object class method with examples. keep posting such useful stuff.